Many movies, books, and comic strips with aviation themes appeared during the late 1920s and 1930s. Rogers was a popular character in a comic strip which first appeared in 1929 and ran until 1967. 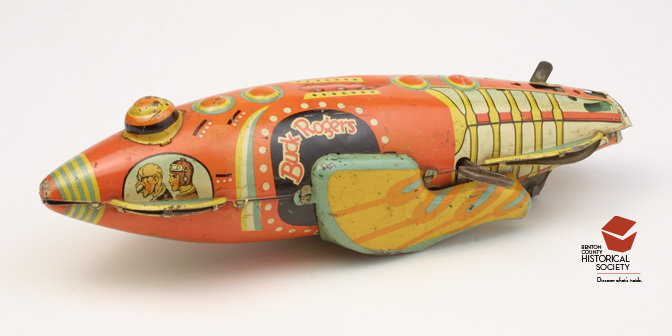 Buck Rogers, a World War I veteran who is transported to the future, first appeared in a pulp magazine novella and later became the main character in a comic strip and a radio program. This wind-up toy version of his ship shows Buck in the window on the left side.